" Norris Dam by Night - Tennessee - Linen. " 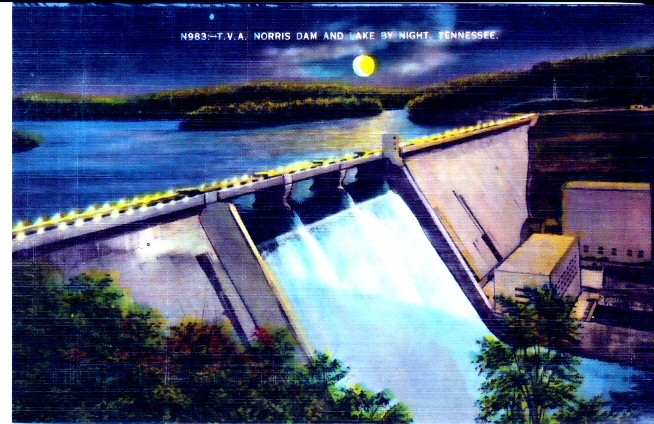 (1913) POSTCARD: Norris Dam by Night - Tennessee - Linen. - Condition: Excellant. - Not Posted. Picture is of the TVA Dam constructed on the Clinch River in North East Tennessee. The project was begun in October 1933 and finished in March 1936. It is a straight concrete gravity-type dam, 1860 feet long, 265 feet high, and 208 feet thick at the base, equipped with two 50,000-kilowatt generators. Total cost of construction, including acquisition of reservoir lands, was about $36 million. The project relocated approximately 2900 families and caused the removal of over 5,000 gravesites. Price: $2.50 + shipping.